Guess who had a job interview today! The National flag Foundation needs an Office Manager. Fast. So they are letting me work every day until we leave for Christmas. They started me today. And they may or may not hire me on after I get back. I'm hoping they will, of course- we could definitely use an income. But even if they don't, I will get paid for this next week! How exciting. BUT. I didn't post at all yesterday. I can't even remember the last time that happened. So I'll try and do better, but I can't make any promises since this week was supposed to be my Christmas Craft/ Gift Crunch Time. And instead I will be working full time. HOWEVER. I have some really big/awesome stuff planned for this weekend. Stuff you aren't going to want to miss. 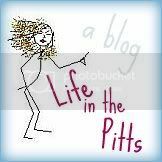 So check back Friday to see what I am planning for Life in the Pitts. congrats on the job - that is good news! Hopefully you can stay on after Christmas. I love your blog Helena, but I understand if you can't post everyday... How is it coming? I'm sure they'll hire you back on. And I'm glad they're gonna at least pay you for the week! Yay, Don't you just love getting money?